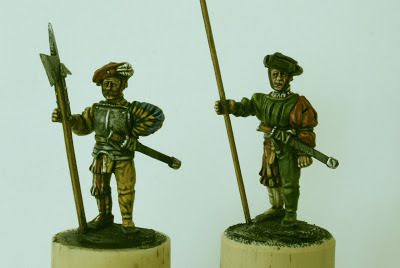 In this page I'll attempt to explain how I paint Landsknechts - do feel free to ask any questions by commenting and I'll try my best to answer them. This method might seem a bit long winded but it's something which for me has evolved and I find it gives consistently good results. Once you get used to it doesn't take that long. 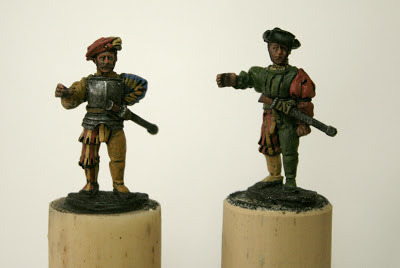 These two figures took me around 3 hours for the pair. You can read more on the palette I use via the dedicated page on the right. 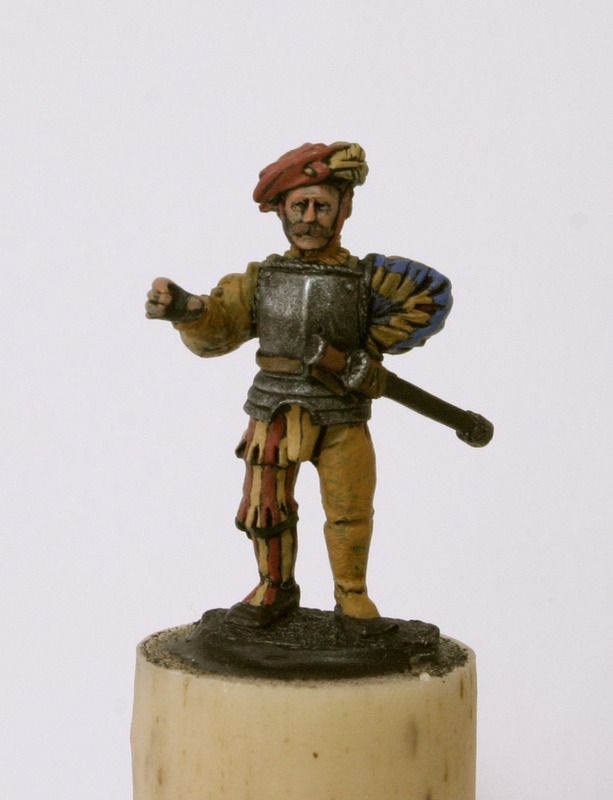 First choose the figures that you wish to paint, I have used some figures from Warlord Games and very good they are too; they have really crisp moulds and the dedication into their research really shows in the sculpting topped with very characterful expressions. 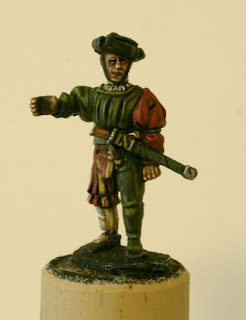 I think these will go far and I'm hoping to see their burgeoning range expand in the future but for now they work well on their own and also mix easily with the Perry sculpted Wargames Foundry Landsknechts. 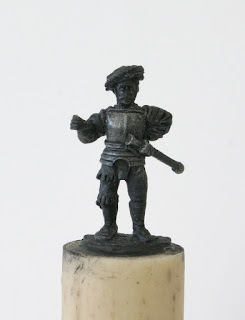 Prepare the figures by cleaning them up using a scalpel and needle files; carefully trim or file away any flash and mould lines leftover from the casting process then glue each of the figures to a rubberised cork (I use PVA, dried overnight). The cork will give you something to grip quite easily whilst minimising any strain on your hands. 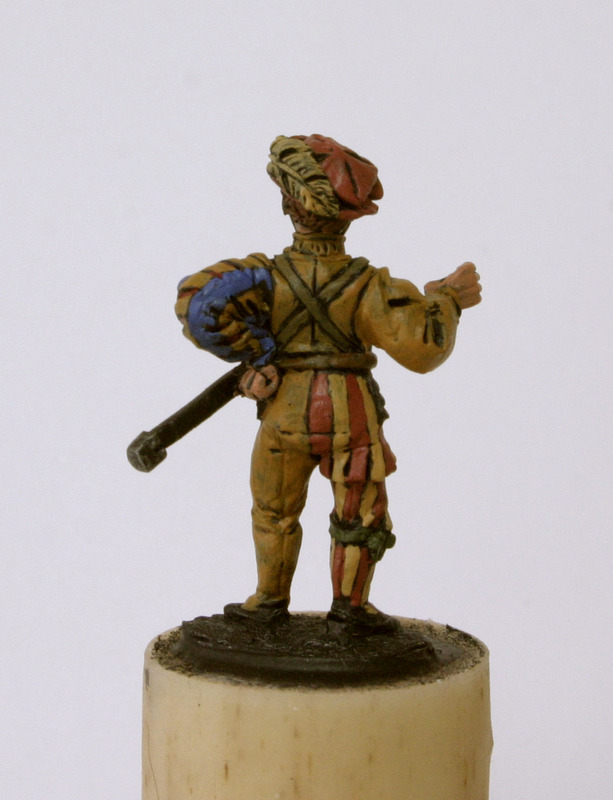 Old paint pots also work quite well too. 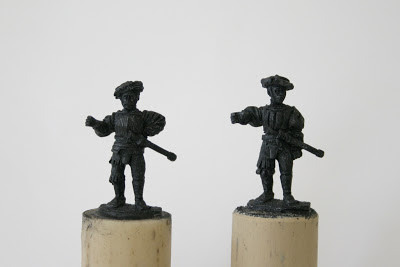 Once the glue has dried fully undercoat each figure black, paying particular attention to any nooks and crannies. A black undercoat will do you a lot of favours, and in my opinion is the best way to paint Landsknechts; it will give you a fine line between each colour and area which will in turn enhance the difference in colours prevalent with these mercenaries. 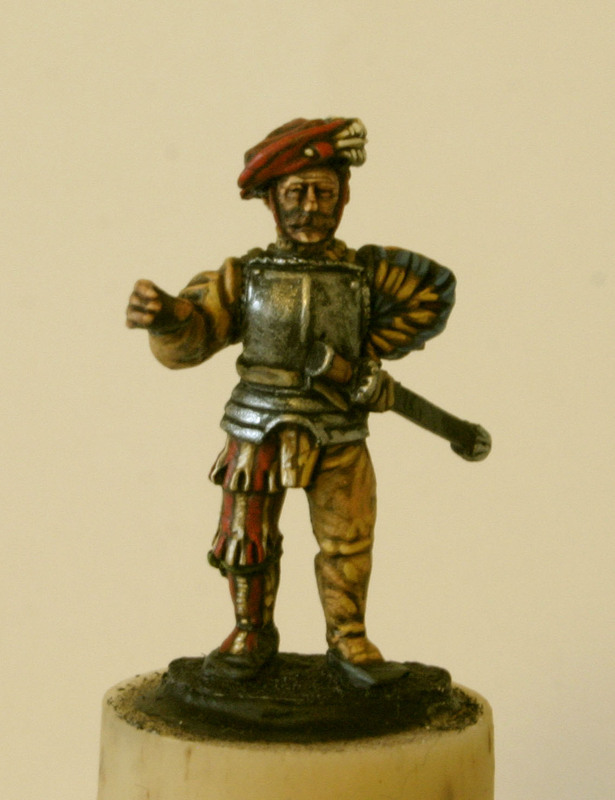 I have tried painting from white and grey undercoats and the results are nowhere near as good. When the undercoat has dried lightly dry brush any armour in the shade colour, Foundry chainmail in this instance. 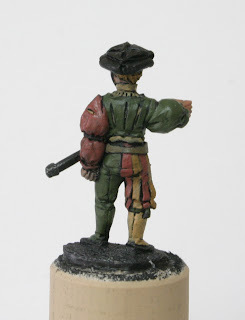 Before moving on, decide how you want your figures to look; Have a browse of Pinterest or practice with the line drawn woodcuts to see what works and remember the basic rule of two to three main colours complemented with one or sometimes two further additional colours. I have found that having at least two areas (such as the chest and arm) in the same colour anchors the figure quite well. Painting each area in a different colour looks gaudy and in most instances doesn't work. 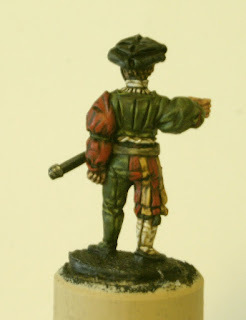 Apply your colours from the inside out, as though the figure is being dressed is the best way I can describe it. 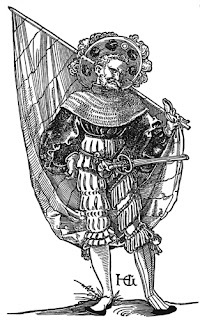 Start with the flesh, then the shirt, doublet, arms and hose then move on to any ribbons and finally the belt, shoes, hat and plumes. Try to be as neat as you can and leave a black line between each colour and in any predominant folds or creases. 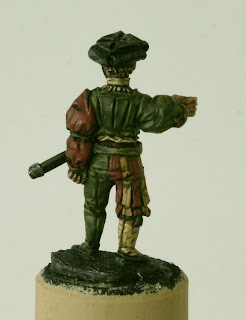 In the case of any slashed areas, carefully paint the undershirt with a fine detail brush first then move on to the doublet or arm, this way you can overpaint any mistake without any worry. You may find it easier to do this after the wash.
For the striped areas paint them evenly and don't feel tempted to follow the slashes; In the right leg of each of these figures I have demonstrated one following the slashes and another not following slashes, they both give quite subtly different results. 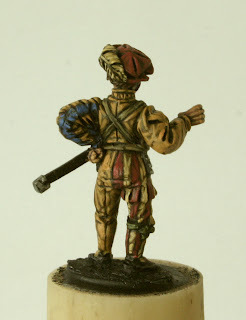 Try and leave a very fine black line between each stripe and don't worry if you get any paint on any ribbons as you can just re-undercoat them in black and paint them in the base colour last. This dark wash works with the black undercoat to give further depth and definition to the figure. It also serves to add a certain muted feel to your palette by creating an extra shade colour across all areas. If washes don't suit you just ignore this and the following stage. This next stage might feel counter-intuitive but see it through, I promise it works! When the washes have dried, very neatly re-apply the shade colours to the figure, paying close attention to leave any areas where the wash has settled. In effect, the dark wash colour becomes the shade colour and the 'shade' colour from each palette becomes the mid tone, this is essentially the key to the lived-in feel of my painting style. You'll now have a very neatly defined starting point and you've done the majority of the work. The next bits are easy on top of this foundation. Now simply paint on the mid-tone colour onto any raised areas with a fine detail brush, again being careful to ensure that you are highlighting the colours you have just applied rather than just overlaying the paint - it's all about building depth so you'll find that you won't need very much. Because of the extra depth that the wash and re-apply has created you could choose to stop at this stage if you want to achieve the muted feel mentioned earlier. Now very sparingly apply the final highlight colour - if you think it's worthwhile, it isn't always - again being careful to highlight the mid-tone colour and not to overlay it. 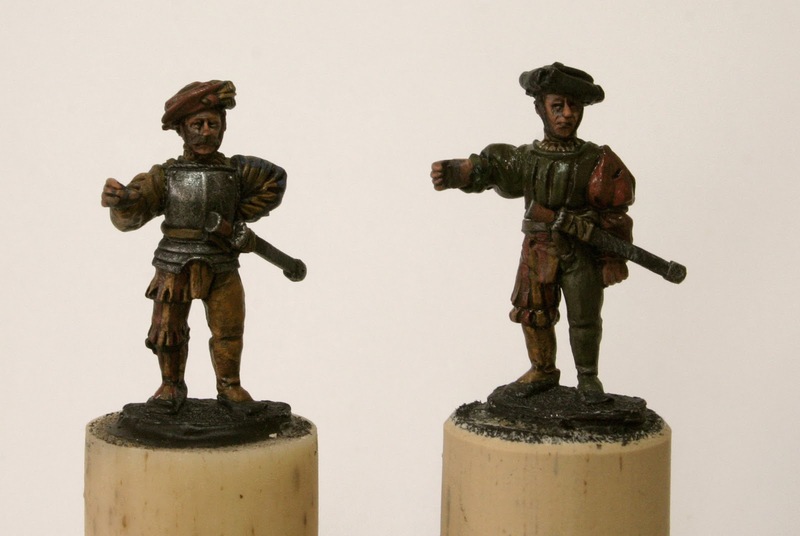 We're almost finished now and the figures are ready for their respective weapons. 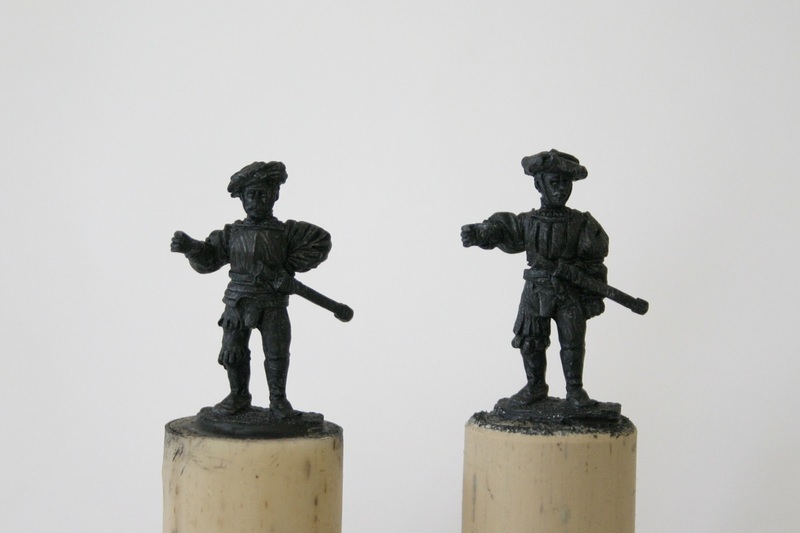 Once the glue has dried, undercoat the weapons black, drybrush the halberd and pike tips and paint the shafts using Foundry spearshaft, 13A,B &C respectively (there's no need for a wash in this instance). The wide flat tip allows you to apply neat lines of paint by lightly dabbing up the length of the halberd or pike. 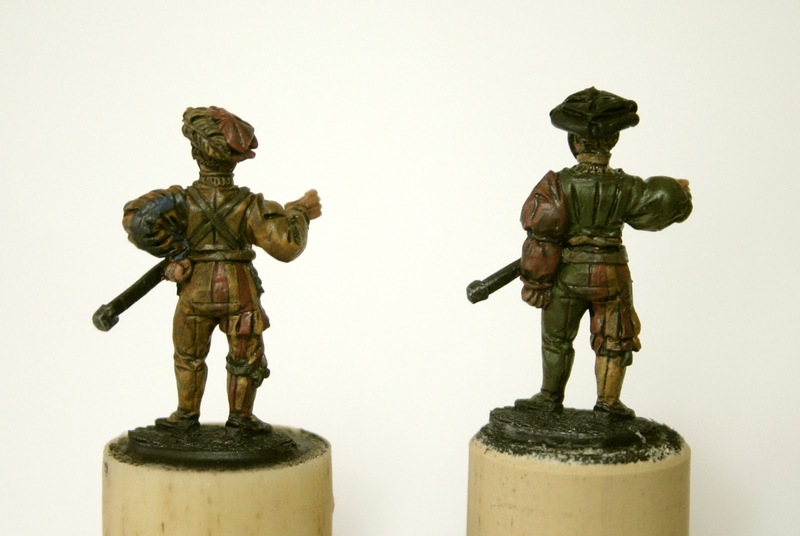 Carefully apply each coat in the spearshaft palette leaving some of the previous colour showing through. I hope all that makes sense and is of some use, as I mentioned please do comment and ask questions and i'll try my best to answer them. Very insightful tutorial Stuart - great to see how the maestro does it! - and appreciate the time spent in putting it together. 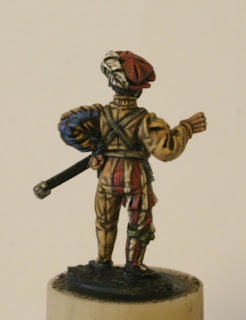 Interesting to see how you use washes - think I should use them more myself and not just limit them to when I'm looking for a 'fast' shortcut. Thanks Simon and no problem, I enjoyed it. I've experimented with washes for quite a while; developing a different wash for most primary colours but they were proving difficult and a bit time consuming so I started experimenting with an overall dark wash with the exception of flesh which benefits from a reddish hue to a brown wash. I have found that it works on all of the palette that I use and gives really pleasing results. It seems to add an extra layer of depth along with very delicately muting colour to make the fabrics look more convincing and lived in. 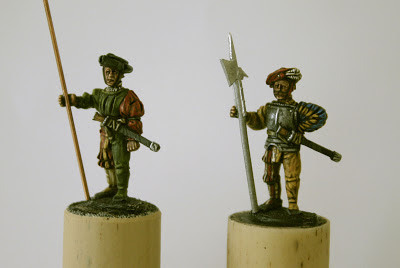 In some ways it can seem like i've added an extra step into the painting process but it does generally mean that the highlighting stages use much smaller amounts than i did previously and with seemingly much better results. I'm also using larger brushes for some of the stages which has sped things up so overall I think my painting has actually got a little bit faster. Anyway, if you give it a go, let me know how it works out for you. have already put your theory into practice! 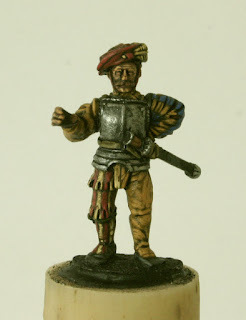 Have used more washes on some HYW commanders - will post pics when based up, hopefully next weekend. Excellent, good job, I look forward to seeing them. Very nice - thanks for the tutorial. This is the muted effect which I also go for. I have been using devlan mud for the wash but recently switched to the Coat d' Arms Super wash - Dk Brown, but having seen your work, will now experiment adding water and dark brown. By the way, may I ask the palette that you used for your horses please? Hi Joe, I follow a similar 3 step procedure for horses with a variety of palettes but the most frequent are foundry deep brown leather, tan, drab, canvas & chestnut. All with a brown wash after the first coat. 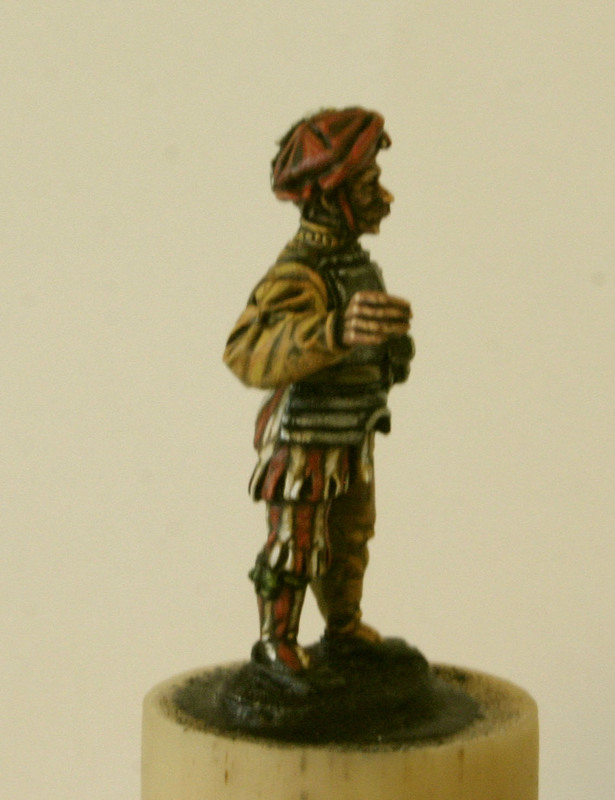 I'll try and remember to add some detail to this effect on the Army Royal blog the next time I do some cavalry. 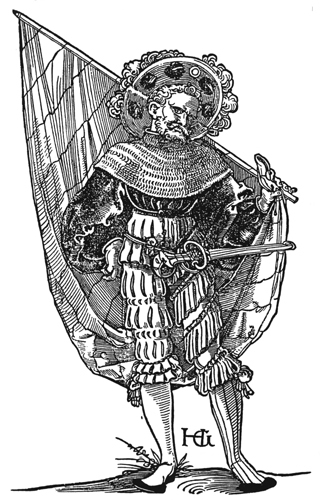 What halberds do you use?